Robert Whittaker is probably the most underrated champion in the UFC and he is back to defend his middleweight championship for only the second time after winning it 19 months ago. He has not been as active as he would like as his last two fights were brutal wars against ‘The Soldier of God’ Yoel Romero. Their first fight in 2017 for the vacant title was a incredible, with Whittaker earning a decision, but it came at a cost as Romero aggravated a knee injury to force him out for a year. On his return, he threw down with the Cuban again putting on one of the fights of the year but fought with a broken hand forcing him onto the side-lines again. Even when you beat Romero you get hurt so Whittaker will be glad to see the back of him, but he has another very difficult challenge in the shape of Kelvin Gastelum. He is only on a two-fight winning streak but they were superb – a knockout over the former champion Michael Bisping and a decision over another top contender in Jacare Souza. We expect this to be nothing more than a barn burner: both fighters are immensely skilled and the interesting factor is that they are both former welterweights fighting at a more comfortable weight, so we will see the very best out of them. Wherever this fight takes place it will be exciting. Both are tremendous grapplers but the majority of this fight should take place on the feet. 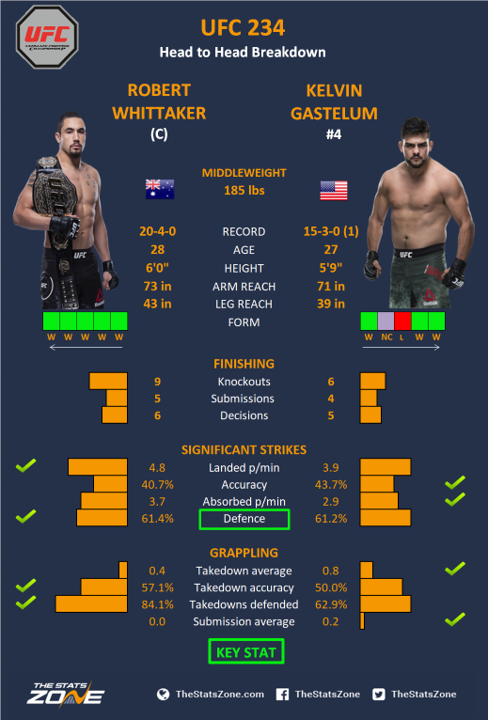 It will be a fierce contest between Whittaker’s fluid combinations of punches and kicks and Gastelum’s lightening fast Boxing. Whittaker’s biggest threat will be Gastelum’s straight right and even though ‘The Reaper’ ate everything Romero served up, Gastelum is deceptively powerful and fast. His biggest threat will be the Aussie’s gas tank. If he can survive the first three rounds you have to favour Whittaker who is an elite athlete. This will be extremely competitive but you feel Gastelum needs an early finish as Whittaker will get stronger as the fight goes on. As Gastelum’s stamina has always been suspect, a late finish is a good bet.